Saturday, June 2, 2018, 6:30-9:30 PM. NOAH’S Event Venue, 21 Rahling Circle, Little Rock, AR 72223. This is a private party, by invitation only, and is NOT open to the public. Address: 320 W. 7th St.
MarQuis Hunt will be performing with an impressive lineup of professional musicians. Don’t miss this great show! Friday, June 1, 2018, 10 PM – 1 AM. Legoria’s Rhythm & Rocks Jazz Bistro, 723 Central Ave., Ste. 200, Hot Springs, AR 71901. $10 at the door. The Isley Brothers are performing at Oaklawn’s Finish Line Theater. 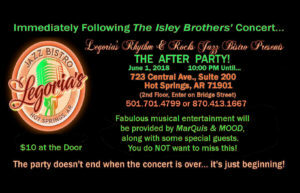 Immediately following the concert, there will be an after party featuring members of the Isley Brothers’ band and MarQuis & MOOD will be performing with them. Don’t miss this one! Monday, May 21, 2018, 7:30 – 10:30 PM. The Lobby Bar, 320 W. 7th St., Little Rock, AR 72201. (501) 374-2615. Free admission. Free parking. 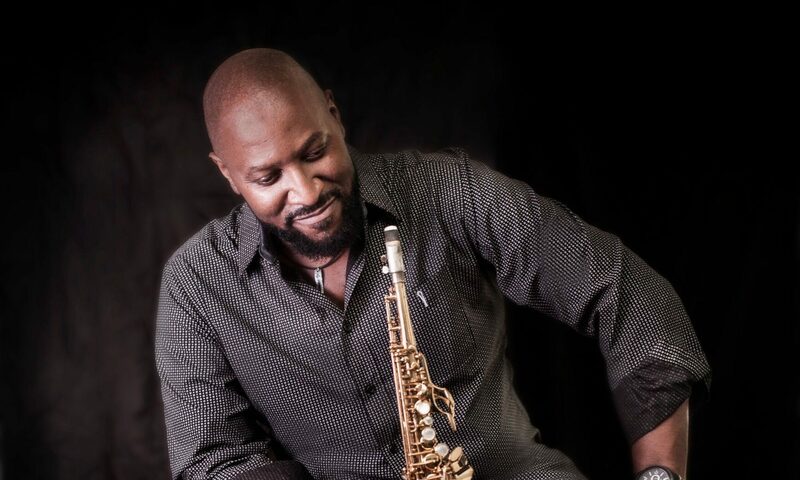 MarQuis Hunt will be jamming with the talented lineup of professional artists. The non-smoking venue is laid back. Drinks available for purchase. Complimentary hors d’oeuvres. Friday, May 18, 2018, 10 PM – 12 AM. South on Main, 1304 S. Main St., Little Rock, AR 72202. $10. 501-244-9660 for reservations. 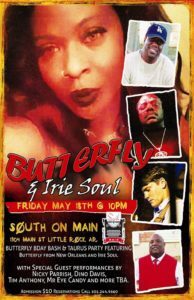 MarQuis Hunt & members of MOOD will be performing with Butterfly & Irie Soul at South on Main for this extraordinary birthday bash. (Butterfly is the one-and-only Katrice Newbill.) Special guests include Johnny B. Burnette, Nicky Parrish, Tim Anthony, Dino D. Davis, Reginald Hameth and others. You don’t want to miss this one! Site designed by L A Rose. ©2019 L A Rose. All Rights Reserved.